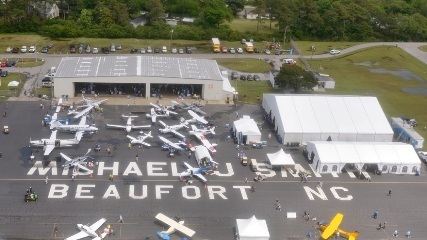 6/14/2016–Beaufort, NC–On May 20 and 21, 67 member from 15 North Carolina Civil Air Patrol Squadrons converged on the coastal town of Beaufort, to support the Aircraft Owners and Pilots Association (AOPA)’s first of four regional 2016 fly-ins featuring CAP’s 75th Anniversary. Most of the CAP cadets, seniors and family members were in a support role such as set up/tear down, vehicle or aircraft marshalling. Several members also worked at one of two CAP recruiting stations on the field. An Incident Command Post was organized as part of the command and control structure that CAP used to track our members and respond to any ELT activations on the field or missing aircraft as needed. By nature, fly-ins have a higher possibility of an aircraft mishaps due to the concentration of aircraft. The NC Wing managed the fly-in as a training event. Major John May, NC Wing Director of Emergency Services was the on-sight incident commander, developed the incident command plan and coordinated possible response actions with local law enforcement who had overall jurisdiction for the event. He also let the FAA and AFRCC know CAP was on the airfield in case they needed our assistance for unclosed flight plans, missing aircraft or other aircraft incidents. Major Fred Draper/NC-169 set up the Wing Communications trailer as the incident command post providing FM and VHF radio communications. Several squadrons who were assigned aircraft security or marshalling were also serving as Urban Direction Finding (UDF) teams in case a hard landing set off an Emergency Locator Transmitter. Unfortunately, the weekend’s low clouds and visibility significantly reduced the fly-in traffic. Instead of the 500 aircraft projected by AOPA to attend, AOPA reported approximately 230 aircraft arrivals from Thursday thru Saturday. Part of the CAP’s mission this weekend was education and recruiting. The NC-126’s Honor Guard presented the colors at the AOPA Fly-in kick off breakfast. Later, these cadets changed back into their battle dress uniforms and helped direct increased vehicle traffic due to poor flying weather.